As a recipient of a Graduate Professional Development Grant from the Nanovic Institute for European Studies at Notre Dame, I was able to attend and present my work at the annual conference of the American Society for Eighteenth Century Studies, held in Los Angeles, California, March 19-22, 2015. This was a great opportunity for me, as I got to participate in a panel on the British writer Frances Burney, which particularly focused on her later life and career (“Frances Burney After 40”). I presented a paper entitled “Responsibility, Terror and Virtue in The Wanderer: Illuminating Burney’s ‘Ethic of Fear.’” My presentation questioned earlier readings of Burney’s fiction as promoting an “ethic of fear” adhered to by Burney herself throughout her life. Reading The Wanderer as a response to Edmund Burke’s Reflections on the Revolution in France, I argued that Burney’s use of a Burkean language of “responsibility,” coupled with her choice to set her last novel against the background of the French Terror, actually exposes a modern ethic of responsibility as an ethic grounded in fear, and, as such, one to be wary of. This paper represented a portion of my larger dissertation (“Responding to Responsibility in the Fiction of the French Revolution, 1789-1814”), which I have since finalized and defended. I am grateful to have had the chance to share and get some feedback on my work prior to my dissertation defense, and to have made some important connections with other scholars in my field as I move into the next stage of broadening my project into a publishable work. Besides the invaluable opportunity to share my own ideas, attending the conference also gave me the chance to hear new ideas and become more familiar with current trends in my field. 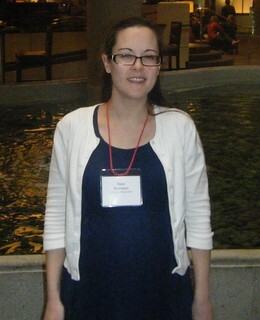 I attended several sessions that suggested new directions in which I might develop my own research. Of particular interest was a panel chaired by my advisor Julia Douthwaite on French immigration patterns and laws during the Directoire period of the French Revolution (“The Directoire (1795-99): A Forgotten Milestone in European Immigration”). As a scholar of French revolutionary fiction, I was glad to become better acquainted with a period of the Revolution that has historically been neglected. I was especially intrigued by Ourida Mostefai’s tracing of the etymology and shifting connotations of the term “émigré,” and by Kelly Summers’s history of changes in emigration law throughout the revolutionary period. A session on debt and finances in eighteenth-century British women’s fiction (“Debt and the Maiden: Women Writers and the Economics of Authorship”) was also quite helpful to me, as it related directly to one of the issues I raise in my dissertation, one that I am seeking to develop further as I contemplate publication. This year’s ASECS conference revealed a growing interest in the interplay of eighteenth-century fiction and economics, a theme that I touch on in my own work. The conference thus confirmed to me the relevance of my research on the concept of responsibility in fiction, and the demand for projects like mine.